Drs. Francesca Gelfo, Paola De Bartolo, Laura Petrosini, and Fulvio Florenzano used Imaris software to better understand how the brain’s morphology changes in response to experience. The software allowed them to analyze individual dendritic spines even in the highly dense clusters of spines that occur in the Purkinje cells of the cerebellar cortex. The researchers were particularly interested in understanding how enhanced physical and cognitive stimulations from a prolonged exposure to complex stimulations induce morphological modifications in the cerebellum and how these changes strengthen neuronal connectivity in a way that ameliorates behavior and the capacity to cope with future damage. For their study, the researchers used what is known as the environmental enrichment paradigm, which involved housing male rats in an enriched or standard environment for 3.5 months, starting 21 days after birth. 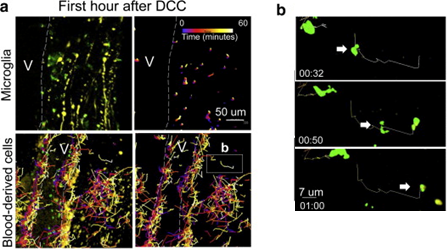 They analyzed the density and size of dendritic spines of Purkinje cells from both sets of rats. Purkinje cells represent the main computational node of the cerebellar cortex, receiving multiple converging synaptic inputs and providing the only output of the cerebellar cortex. Imaris allowed the researchers to overcome a very difficult analysis challenge: the high spine density of Purkinje cell distal dendrites. Single dendritic spines can sometimes even overlap to form spine clusters that make it difficult for analysis (see figure). Immunofluorescence image (left), volume rendering (middle), and merged image (right) of cerebellar Purkinje cell spines located in the distal dendritic region and analyzed using the Imaris Filament Tracer module. Courtesy of Dr. Fulvio Florenzano. Using a confocal laser-scanning microscope, they obtained z-stack series of the entire dendritic tree of Purkinje cells. They then used the spine detection feature in Imaris Filament Tracer to generate spine reconstructions from the z-stack images and to measure the mean area, length, and head diameter of Purkinje cell spines. Imaris-based morphological analysis allowed them to infer the adaptations/reactions that took place in the cerebellar circuitry after exposure to complex stimulations. Overall, this study’s results showed that complex stimulations modify the spine morphology of cerebellar Purkinje cells and induce remodeling of synaptic connectivity on which high-level functional performances are based. Recently the researchers continued their work by using Imaris to analyze the effects of environmental enrichment on Purkinje cell spine morphology in the presence of cerebellar lesions. This research also investigated how the behavioral performances of the enriched animals with lesions were related to lesion-induced and activity-dependent morphological changes (Gelfo et al., Brain Structure and Function, in press), once again demonstrating the convenience of analyzing spine morphology as tool to study the recovery following brain lesions. Research Paper: De Bartolo P, Florenzano F, Burello L, Gelfo F, Petrosini L. 2015. Activity-dependent structural plasticity of Purkinje cell spines in cerebellar vermis and hemisphere. Brain Struct Funct. 220(5):2895-904. doi:10.1007/s00429-014-0833-6.